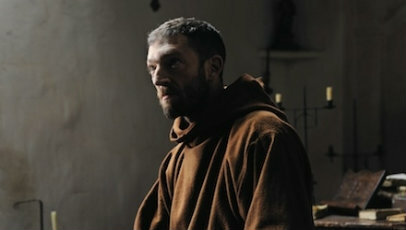 Abandoned on the doorstep of a monastery in Spain, Ambrosio (Vincent Cassel) becomes a devout friar known far and wide for his ethics and traditionalism, much like the Capuchin monks who raised him. However, after suffering a series of terrorising dreams, he becomes entranced by a masked figure who takes shelter in the monastery. Discovering the figure is actually a woman named Valerio (Déborah François), Ambrosio seduces her, beginning his slow descent into a world of sin. The Monk, based on Matthew Lewis’ revered and controversial eighteenth century novel of the same name, positions itself strongly as a character-driven, muted period drama. The script, co-written by Dominik Moll and Anne-Louise Trividic, focuses its attention on the psychological aspects of Ambrosio’s fall from grace, heightened by the manifestations of evil that have infected his subconscious and the arrival of the elusive Valerio, played with tremendous sexuality by François. Unfortunately, due to the languid pace the film adopts and the fact it fails to properly delve into Ambrosio’s upbringing and true self, The Monk only barely scratches the surface, failing to deliver a truly believable depiction of a devout monk’s deprived state of mind. While the elusive tone will help maintain the audiences’ interest, the result is a film that feels weak, morose and disconnected in comparison to the controversial label its source material carries. Where the script execution suffers and investment often feels unrewarded, the imagery, Gothic symbolism and Patrick Lussier’s cinematography prevail. The contrast between the barren and concealed locale of the monastery and the harsh light of the outside does well to exemplify the turmoil Ambrosio feels. That said, it feels somewhat too muted and concerned with metaphor to enable the story to feel relevant in this day and age. Cassel, though, with the vast weight of the film placed upon his shoulders, does remarkable work here, often acting as a redeeming force for many of Moll’s faux pas. Ambrosio’s tempered mental state is well captured by Cassel’s subtle, pensive performance. When it comes, however, Cassel does madness spot on and is able to, without a shade of conviction, epitomise a man split in half by the honour of religion and the seduction of sin.